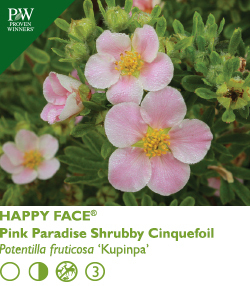 This neat, small bush has winsome semidouble clear pink flowers with long-lasting color from early summer to frost, showing up beautifully against dark-green foliage. Hardy and tidy, it's a dandy! PICK-UP Day/Time: This item will be available for pick-up on Arbor Day weekend, April 24-26. Please see pick-up day/time listings on the plant sale pages to choose your preferred pick-up time (there is no charge for this item, but it must be selected in order to complete your order).